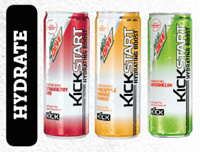 Mountain Dew® is “kicking it up yet another notch” with more great flavors in the Kickstart™ line. Now with 10 flavors to choose from, your taste buds will be doing a happy dance with these low-calorie choices. Most people consume about 400mg of caffeine per day and about 64% of the US population is consuming energy drinks each day. 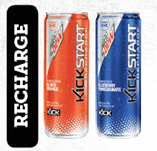 Mountain Dew continues to expand the Kickstart line year after year to meet rising demands of this growing market. Kickstart is on target to become a $1 billion brand by the end of 2016. I’m excited to share more details on the four new flavors that were released - Watermelon, Blood Orange, Blueberry Pomegranate, and Midnight Grape. Start your day by cracking open a can of Fruit Punch or Orange Citrus flavored Mtn Dew Kickstart. With only 40 calories per eight ounces, it’s the perfect amount of caffeine to get your morning (or party) started. With nearly 90 percent of Americans consuming caffeine on a daily basis, it’s of no surprise this energy drink is an emerging beverage on the list. Hydrate is the union of coconut water + Kickstart + real fruit juices. Perfect for an afternoon pick-me-up or after a workout, Hydrate is available in Strawberry Kiwi, Pineapple Orange Mango, and Watermelon flavors. With, it’s a taste that will be sticking around for a while longer. Still need a reason to try it? Check out this super-awesome video. Beat the afternoon slump with a Blood Orange or Blueberry Pomegranate Mountain Dew Kickstart. Enjoy the added benefits of antioxidants and vitamins C and E - all while keeping the calories in check. Writer’s block ‘ain’t got nothin’ on you if your fridge is stocked with Kickstart. Pulling an all-nighter? Gearing up for a night out? Limeade, Black Cherry, and Midnight Grape are just what you need to burn the midnight oil; the right amount of caffeine and still a mid-calorie beverage. Winner, winner! Powerstance through anything. With these new Kickstart flavors, this emerging beverage line is making waves and taking flavor recommendations. Look for Fruit Punch, Black Cherry, and Orange Citrus four-pack buying options coming soon!